A plan for Northern Ireland to accept some EU rules has met with opposition in Belfast and demands for similar treatment elsewhere. Prime Minister Theresa May's best hope is to fudge tough decisions, and use the threat of a chaotic exit – or another election – to quash dissent. Avoiding a hard border in the region is an aim of all sides in the Brexit talks. The least-worst fix is for Europe to treat Northern Ireland the way it does Norway. That’s only possible if pro-UK politicians in Belfast can be made to see the economic necessity. The 20 bln euro no-frills airline will meet its full-year profit goal despite a rostering mess that cost it thousands of flights. Passenger numbers were up 11 pct in the six months to September. Ryanair’s fare cuts helped, but it also got lucky with rivals’ bankruptcies. The building materials company is buying Kansas-based Ash Grove for $3.5 bln including debt. It’s a full price for a group which likes to buy cheap. Despite doubts over President Trump’s pledge to rebuild highways and bridges, pushing into its key market makes sense for CRH. The EU wants the Northern Ireland border issue resolved before the UK’s wider exit terms can be agreed. New proposals from London effectively couch Britain’s trade agenda in concern for the peace process. Having Dublin onside raises the chances of Britain getting what it wants. Shares in the Irish bank rose 8 percent after a heavily oversubscribed IPO. The government - still the lender’s majority owner - may be tempted to rethink a self-imposed cap on how fast it can offload its remaining stake. But political wrangles make a speedy exit unlikely. A Conservative pact with Northern Ireland’s DUP party is focusing minds on what Brexit means for the UK’s only EU land border. It also rules out a potential fix: EEA membership. The upside of their odd coupling is a more frank debate about challenges that lie ahead. The Irish government will sell 25 percent of the nationalised lender for between 3.9 and 4.9 euros per share. The midpoint values the bank above domestic rivals but at a discount to European peers. That’s a fair reflection of its bad loan book and domestic economic risks. 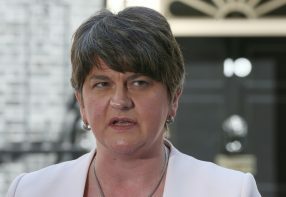 British Prime Minister Theresa May's attempt to form a government with Northern Ireland's DUP could come at a high price. True, the party is pro-Brexit and wants to avoid a UK breakup. But taxpayers can expect greater fiscal transfers and more friction in the restive region. The U.S. pill distributor said for the third time since October that falling prices would hurt profit. Cardinal Health underscored the hard times ahead by paying $6 bln for Medtronic's medical-supplies unit to diversify. Other links in the pharmaceuticals chain will suffer, too. The country spent 20.8 bln euros rescuing the lender, and has so far got 6.6 bln euros back. A forthcoming listing could, under optimistic assumptions, raise the rest. The staggered nature of the sale, economic uncertainties and the need for a discount point the other way. Nationalist party Sinn Fein made surprise gains in snap elections, buoyed by discontent with the ruling unionist DUP. That puts the duo, who must govern together, on a more equal but confrontational footing. The result may be a bumpier path for Britain’s EU exit negotiations. If Thursday’s elections produce a stalemate, London may have to rule the thorny region directly. The 9 bln pound cost per year of propping up the region is likely to grow after Brexit, but a united Ireland is problematic too. The north is a prize no one wants. The drug company is paying $2.5 bln for Zeltiq and its diet-avoiding, fat-freezing tech. It sounds a wackier play than the dozen deals Allergan struck last year. But vain customers pay cold cash for the treatment, making it less speculative than other deals, like gene therapy. Dublin’s unequivocally pro-Brussels stance may be tested if politics unmoors it from key trading partners like the UK and U.S. A tough Brexit deal, along with an inflated EU budget bill caused by tax inversions, could raise tricky questions about Ireland’s true interests. It's the big loser, in both trade and security, from the UK's exit from the EU. True, Ireland could pick up high-end investment as the UK sheds it, but even that hinges on an attractive tax rate, which is now under threat - both from its neighbour and from Donald Trump's America. The Irish low-cost carrier in 2016 ousted Lufthansa as Europe's biggest airline by passengers. Boss Michael O'Leary has proved better at learning from his rival than the other way round. A full-blown attack on Lufthansa's home turf via a new Frankfurt base is in the offing. Sumitomo is buying Dublin-based Fyffes for 751 million euros. A 50 percent premium is expensive for the humble fruit, especially with no major banana boom on the way. Access to more volumes and markets gives the Japanese group agility in responding to global demand.